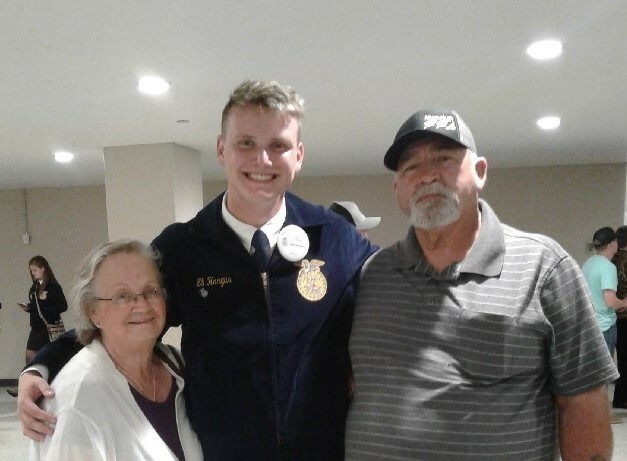 Eli Hargus, a member of the Ninnekah FFA chapter in Ninnekah, OK, will be on stage in the spotlight Oct. 24-27 during the 2018 National FFA Convention & Expo in Indianapolis. The National FFA Chorus will perform several times during the national convention and expo, adding excitement and motivation to the sessions through their music. Hargus will join fellow chorus members in Indianapolis for rehearsals three days before the convention and expo begins. Eli, who is a Junior at Ninnekah High School, has already been a member of the Oklahoma State FFA Chorus twice. Most recently, he sang alongside other chorus members at the State FFA Convention this past May in Oklahoma City. Ninnekah Schools is proud that Eli is representing our school and our state! Corteva Agriscience™ Agriculture Division of DowDuPont™ sponsors the National FFA Chorus.